Paddington to Canary Wharf in 17 minutes is coming soon! The Elizabeth line, which will redefine transport in London with quicker, easier and more accessible journeys, will open through central London in autumn 2019, Crossrail Limited announced today. The revised schedule is needed to complete the final infrastructure and extensive testing required to ensure the Elizabeth line opens as a safe and reliable railway. The hugely complex ten-year project, delivered by Crossrail Limited, brings together multiple infrastructure contracts, new trains and three different signalling systems. The Elizabeth line will add 10 per cent to central London’s rail capacity, and the project will boost the economy by an estimated £42bn. Crossrail Limited has been working hard to maintain the programme and sufficient testing time is required to introduce the next phase of the railway – the central section between Paddington and Abbey Wood – in a way that can be guaranteed to be safe and reliable. 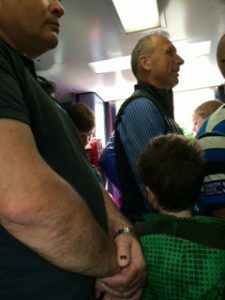 The original programme for testing has been compressed by more time being needed by contractors to complete fit-out activity in the central tunnels and the development of railway systems software. Testing has started but further time is required to complete the full range of integrated tests. The focus remains on opening the full Elizabeth line, from Reading and Heathrow in the west to Shenfield and Abbey Wood in the east, as soon after the central tunnels open as possible. The new Elizabeth line trains are already operating between Shenfield and Liverpool Street (mainline station) and between Paddington (mainline station) and Hayes & Harlington, in readiness for the full opening. The trains are also being tested in the Heathrow tunnels. Construction activity is drawing to a close including the completion of the remaining architectural fit-out in the new central section stations. The new railway, jointly sponsored by the Department for Transport and Transport for London with support from London’s business community, will connect stations such as Paddington to Canary Wharf in only 17 minutes, transforming how Londoners and visitors move across the capital. The Elizabeth line will bring an extra 1.5 million people to within 45 minutes of central London and more than 200 million passengers are expected to use it every year. 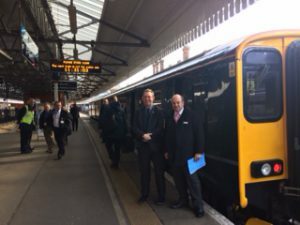 Specifying the South Western Franchise: THE OTHER HALF Response from South West Stakeholders to the Department for Transport Rail Executive’s Consultation on the new South Western Franchise has been published and can be read here. Huge turnout as Transport Minister Claire Perry addressed our “Transport, Growth and Economy” Meeting on Saturday 7 March.